Chart No. 13 - Fig. 1. Release of Pattern Energy Blocks in the Cerebro-Spinal [Cerebrospinal] Fluid. Fig. 2. Structural Bipolar Release of Respiratory Muscles. A rhythmic stimulating double contact over the brachial plexus and phrenic nerves for diaphragmatic response. 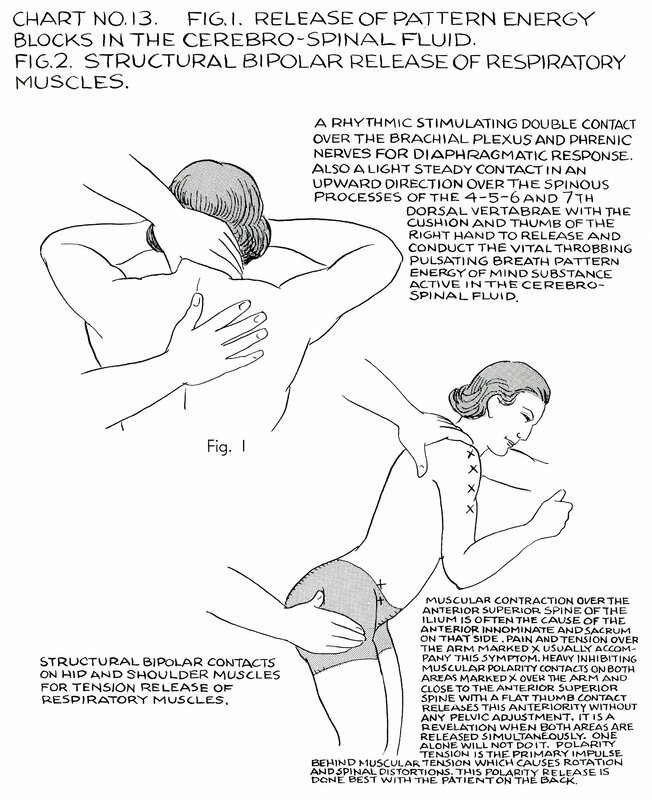 Also a light steady contact in an upward direction over the spinous processes of the 4-5-6 and 7th dorsal [fourth, fifth, sixth, seventh thoracic, T4, T5, T6, T7] vertabrae [vertebrae] with the cushion and thumb of the right hand to release and conduct the vital throbbing pulsating breath pattern energy of mind substance active in the cerebro-spinal [cerebrospinal] fluid. Structural bipolar contacts on hip and shoulder muscles for tension release of respiratory muscles. Muscular contraction over the anterior superior spine of the ilium [ASIS] is often the cause of the anterior innominate [hip] and sacrum on that side. Pain and tension over the arm marked X usually accompany this symptom. Heavy inhibiting muscular polarity contacts on both areas marked X over the arm and close to the anterior superior spine [ASIS] with a flat thumb contact releases this anteriority without any pelvic adjustment. It is a revelation when both areas are released simultaneously. One alone will not do it. Polarity tension is the primary impulse behind muscular tension which causes rotation and spinal distortions. 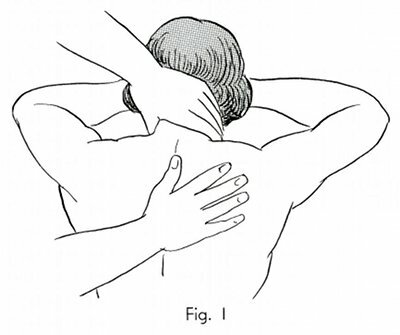 This polarity release is done best with the patient on the back. Book 4, "Explanation of Chart No. 13"